Looking to back up essential elements of your business? Consider the Protector Series QS gaseous generator line. These units powers sensitive business technologies and appliances during power outages, providing profit protection for businesses. 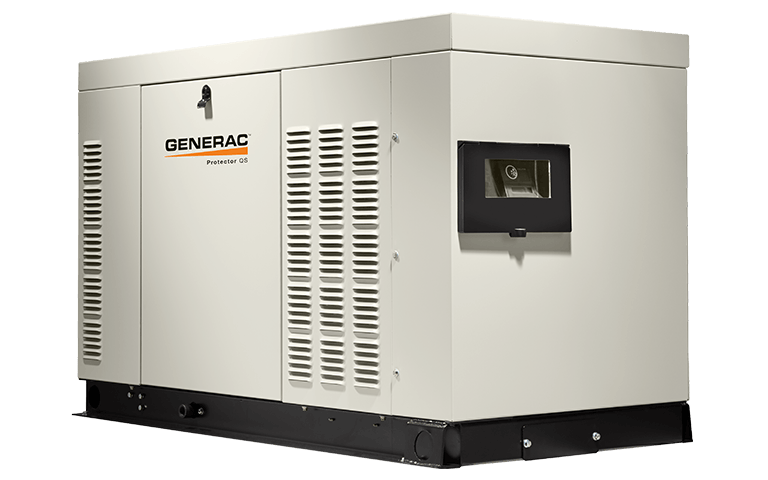 Generac's Protector QS series offers benefits that competitors can’t match. Low-RPM liquid-cooled engine for additional power, but extra-quiet operation and reduced fuel consumption. Installation flexibility and cost reduction. Sophisticated, yet intuitive controls. Quiet operation. Supported by a 24/7/365 customer support team at our corporate headquarters, and a nationwide dealer network of more than 6,000 strong. Engineered to run at only 1800 rpm for substantially quieter performance, the low-speed, liquid-cooled engine on the Protector QS Series packs more power into a smaller footprint than air-cooled models. Enjoy reduced fuel consumption, and long engine and alternator life. Aluminum enclosures provide enhanced durability, and are corrosion resistant, a significant benefit for those businesses residing in coastal and salt-water environments. All backup generators run a weekly test to ensure the system is running properly. Thanks to Quiet-Test, your Protector Series generator runs its self-test at a lower, quieter RPM, and can be programmed to run weekly, bi-weekly, or monthly.